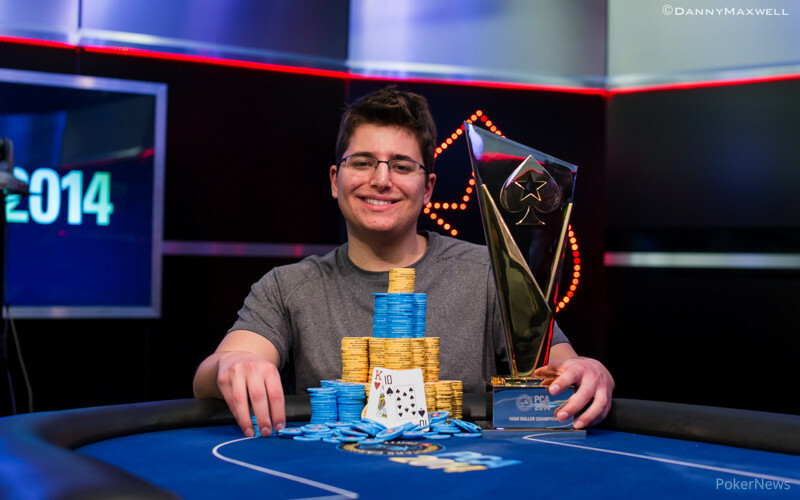 After an epic final table, it was Jake Schindler who took down the 2014 PokerStars Caribbean Adventure $25,000 High Roller. Schindler topped a field of 247 entries and walked away $1,192,624 richer after eliminating former World Series of Poker Main Event champion Greg Merson in second place. The third and final day started with 14 hopefuls all looking for that seven-figure score. Among those, there were two Team PokerStars Pros, one of which held the chip lead and was also the defending champion looking for an amazing back-to-back performance. Vanessa Selbst started at the top, while Daniel Negreanu sat in the middle of the pack. However, Negreanu was eliminated during the first few minutes of play. Negreanu ended up all in holding kings against Merson’s aces., and the Global Poker Index Player of the Decade was knocked out in 14th place. The next player to go was Dan Smith, just minutes later. Smith was all in with pocket fours against Schindler’s aces and the board brought him no help. Dani Stern, the 12th-place finisher, was very unlucky as he had his kings beat by Mustapha Kanit’s ace-eight. Stern took home $98,560, and on the very next hand we were down to 10 as Paul Newey ran king-ten into Aleksandr Denisov’s ace-king. Newey did record his biggest cash to date, though, walking away with $110,740. Myro Garcia from Brazil finished on the final table bubble when he lost a big coinflip against Selbst. Garcia got it in holding ace-king versus Selbst’s pocket tens and he did not find a way to stay alive. 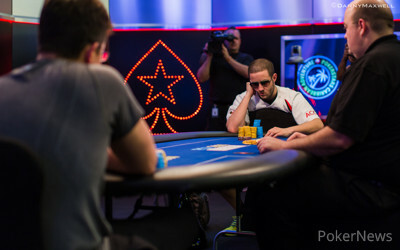 At the final table, it was Selbst who held a million-chip lead over Merson who was in second place. At the beginning of the final table, Ole Schemion doubled through his fellow countryman Marvin Rettenmaier. Schemion turned a straight on Rettenmaier, who held aces. Rettenmaier busted a few hands later when he lost a race with pocket eights versus Merson’s ace-ten. After a very long and quiet period in which Schindler grabbed the chip lead, it was Joao Vieira who was knocked out in eighth place. Vieira held the chip lead on Day 2 for a long time, but the final day wasn’t his. The Portuguese pro ran pocket nines into Rob Mizrachi’s pocket kings. This hand started a brief moment in which Mizrachi took control of the table, but his chip lead did not last long. The next player to go was Schemion. The young, rising German star made the $100,000 Super High Roller final table earlier this week and added another $216,040 to his impressive list of results in this event. Schemion played his usual aggressive style and was knocked out when he ran ace-jack suited into Kanit’s ace-king. Denisov waited, and waited, and waited while all of this was going on. The Russian player was extremely short and he busted shortly after Schemion in sixth place. 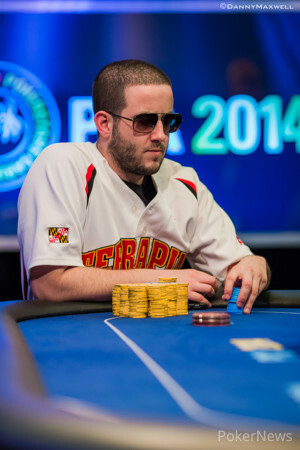 Then, Mizrachi was next to go in fifth place as he ran king-jack into Selbst’s pair of eights. Mizrachi put up a tough fight and walked away with $389,720. Italian pro Mustapha Kanit was knocked out in fourth place for $492,600. Kanit lost a huge pot to Schindler where he rivered a straight, but his opponent had made a flush. On Kanit’s last hand, he ran pocket jacks into Selbst’s aces and then there were just three players remaining. In a shocking turn of events, Selbst was the next player to go. The defending champion lost two big pots within hands of each other and that caused her hit the rail in third place. Selbst collected $607,580, and in total she cashed for over $1.4 million over three tournaments this week. On Selbst’s final hand, she ran ace-nine into Schindler’s ace-ten. On the very last hand of the tournament both Merson and Schindler agreed to go all in blind. Merson showed nine-four off suit against Schindler’s king-ten. The board brought no help for Merson, and he was knocked out in second place, making Schindler the new PCA $25,000 High Roller champion. Merson took home $948,996 after a heads-up deal, while Schindler won $1,192,624 in first-place prize money. After a short heads-up battle the title belongs to Jake Schindler! After Greg Merson had moved all in four consecutive times, and getting four walks in a row, both players decided to go all in blind. "I don't play poker to collect trophies," Merson had said just before this happened and the final showdown went as following. The board ran out and Merson, who had about a million less than his opponent, was knocked out. Schindler took down the tournament and Merson congratulated his opponent before walking to the payout desk. Greg Merson raised to 200,000 on the button, and Jake Schindler called from the big blind to see the flop come down . Both players checked. The turn was the , and Schindler led with a bet of 250,000. Merson raised to 625,000, and Schindler tank-called. The river completed the board with the , pairing it with nines. Schindler led with a bet of 950,000, and Merson went into the tank. Eventually, he made the call. Schindler tabled the , and Merson opted to show his hand after saying that he called the river with king high. He showed the , which was king high, although he did turn a flush draw, but missed on the river. Schindler won the pot and knocked Merson down to 2.6 million in chips. On the flop, Greg Merson checked, and Jake Schindler bet 225,000. Merson raised to 600,000, and then Schindler reraised to 1.175 million. Merson moved all in, and Schindler quickly folded. "I only had a five," said Merson, revealing the . Jake Schindler has extended his lead a bit in the early hands of this heads-up match with 2012 World Series of Poker Main Event champion Greg Merson. On one hand, Schindler limped the button, and Merson checked his option in the big blind. The flop came down , and Merson check-called a bet of 100,000 from Schindler. The landed on the turn, and Merson checked. Schindler bet 350,000, and Merson folded. After that, a hand came up where Merson raised to 200,000 on the button, and Schindler called from the big blind to see the flop come down . Schindler checked, and Merson bet 225,000. Schindler called. The turn was the , and Schindler checked again. Merson fired 350,000 this time, and Schindler stuck around with another call. The river completed the board with the , and Schindler checked. Merson fired 450,000, but Schindler had other things in mind. He check-raised to 1.8 million, and Merson quickly folded. After a short break, in which a deal was discussed, heads up play has begun. A deal was agreed upon and the numbers look as following. The winner of this tournament will go home with an additional $200,000. Play on! Everyone loves receiving something for free, especially when that something is cold, hard cash. 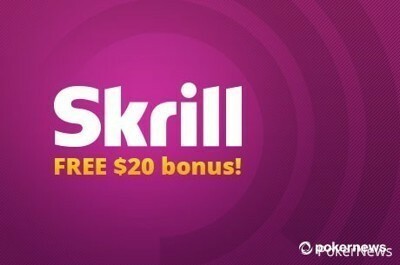 Thanks to the special relationship that PokerNews and Skrill share, PokerNews customers can enjoy a free $20 when they use their Skrill account for the first time to fund an online poker site. Skrill, formerly known as Moneybookers, is the premier online payment solution for millions of customers worldwide. Once you upload funds to your Skrill account, you can distribute them to anyone with a valid email address. In addition, Skrill is accepted as payment across most major online poker sites, meaning you can quickly and easily deposit and withdraw your funds without having to have gambling transactions littering your bank statements! What’s more, Skrill offers its customers a Prepaid MasterCard that can be used in 100,000’s of locations around the globe. In July 2013, Skrill became the Official Payment Processor for the European Poker Tour, adding yet more credibility to this fantastic product. Now, Skrill is a strategic partner of PokerNews and our first choice when it comes to moving money instantly, safely and conveniently around poker sites. To celebrate this special relationship, Skrill and PokerNews have teamed up to bring PokerNews customers a free $20 offer. Getting your hands on this free money is easy, claim yours by following these simple steps. Register for a free Skrill account. Upload funds to your new Skrill account or directly go to a poker room and choose Skrill to make your deposit. Make a deposit of at least $20 onto an online poker room. Skrill will add $20 to your Skrill account within one business day, which you can use to redeposit to a room right away. As mentioned, scores of online poker rooms such as Full Tilt Poker, PKR, Titan Poker, bet365 and Betfair accept Skrill, so you can make your first deposit onto a major player in the online poker room. 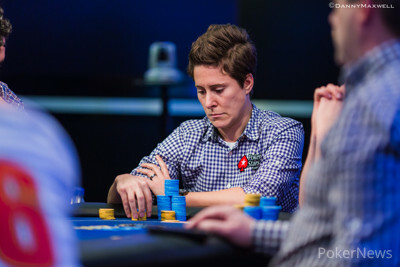 The tournament went on a short break to color up, and move some, chips and right when we got back Team PokerStars Pro Vanessa Selbst was shaking hands with Greg Merson and Jake Schindler. Selbst had been knocked out by Schindler after she moved all in from the button and he called from the small blind. The board ran out and Selbst was knocked out. Considering Selbst's stack she must've lost a big pot previous to this one. We will get you the update on that hand as soon as we can. Selbst had an amazing week here at the PCA finishing third in the $100,000 Super High Roller and also going deep in the Main Event. In total Selbst cashed $1,400,220 at this year's PCA finishing in the money in all three tournaments she played. Team PokerStars Pro Vanessa Selbst raised to 160,000 and Greg Merson responded with an all-in three-bet for 1,180,000. Selbst called and the showdown went as following. "I'm good at this," Selbst smiled. "But I've got the dead man's hand," Merson quickly responded. The board ran out and Merson doubled up again. A High Roller Champion Will Be Crowned Today!